"Made a terrible experience less terrible" Recommends Geoffrey Burg | Accused of a Washington State drug or VUCSA crime? Geoff Burg is an awesome lawyer! 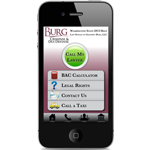 Once he took my case, I received frequent communication from him via text, phone, and email, and felt secure that he was actively working towards our goal: case dismissal. He was knowledgeable and informed me of all my options and possible outcomes, including those negative. In the end, he was successful, getting my case dismissed. If I ever were to need a lawyer again, I would not think twice before contacting him. THANKS!!! – "Made a terrible experience less terrible"